If you've been around here a while, you know I love everything about home and finding unique ways to thrive there with what you have. Having a space (or spaces) to call your own that are uniquely designed and created by you FOR YOU is just a marvelous thing. I can't think of anything better. For me, home is my happy place - my family is here (current and future) and this where I feel most "at home" (with life general), comfortable, and myself. Creating a home that radiates with positive vibrations is essential to thriving for me and I'll do anything to make the spaces we do have livable, welcoming as well as functional - a place where we can THRIVE all the time! Here are my top 10 ways to thrive at home. Buy decor that speaks to you. Not sure what that means? I remember I used to just get one off decor items that I "liked" rather than looking at the decor I was buying as a whole and the way I wanted my home to "feel". So, all of sudden, I had kind of this hodge podge collection of things and none of them really went together. When I shifted my perspective, IT ALL CHANGED! So, you know all those inspiration boards you have on Pinterest? See if you can find a theme in there. For me, it was farmhouse, rustic, light and white, and chic. Light bulb. For whatever reason, in my early journey of decorating, these two things didn't clique. I didn't make the connections! But, now it's all different. Then all you have to do is find your favorite stores that HAVE those themes. For me, it's Target, Hobby Lobby, Home Goods, and Amazon. Nate and I have a single family home and we've had it for about 7 or 8 years now... and it's just us and the two pups! Needless to say, we have lots of extra space right now (which we're looking forward to filling and growing into, for sure). We use probably a grand total of 3 - 4 spaces ALL the time and we have (roughly) a 3,400 square foot house. Yes, that's right. We have 4 bedrooms, 2.5 baths, a bonus room, dining room, formal living room, family room, office, kitchen, and morning room. That doesn't include utility spaces (I left out the garage and our laundry / mudroom space)! So, YES, we have lots of spaces we don't necessarily NEED right now, but we try our best to find different ways to use them. Mostly right now, the operative word is STORAGE ha - BUT. I've also created a super informal library space and my very own office nook in an otherwise unusable area in our bonus room. Also. Nate turned our formal living space into a pool table / man cave (using that term lightly here :) ) for the immediate future. I hope to one day turn our connected formal living and dining room spaces into a playroom / second family room for kiddos and family time! I would say I have about 3 - 5 favorite spots in the house right now, and I'm always looking to add more! There's my spot on the bed in our room, my office nook, the cozy corner of our sectional sofa, one of the many seats at our new kitchen table, and sometimes the front porch rocker. Depending on my mood and where I feel intentionally called, that's the spot I'll go to to either work, read, or create. I really want to add a reading nook in our bedroom, so that will be a future spot for me, 1000%! Yes. This is absolutely essential. It's easy to get into the mindset of "I don't have" and feel like your home isn't good enough yet. Me in particular!! I went through this (and still do) a lot because our home is so over-sized for our current family unit. Most of the spaces we don't live in are not furnished, or are being used for storage (of items that I need to get #konmaried out of my life!!). So it's easy for me to feel like I don't have enough spaces to enjoy time in (which is so silly because the spaces I do have, I LOVE). 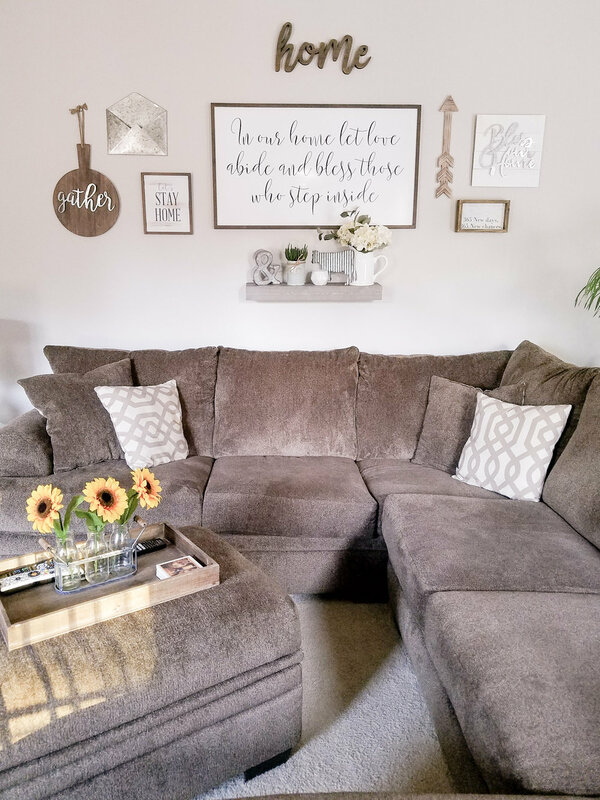 So, I try to be intentional about spending quality time in each space we have furnished and decorated. Not only does it help me appreciate what I do have now, I find when I become more of a regular in a space, it becomes more familiar and even more at-home. That's a funny thought - to feel uncomfortable in a space in your own house! But, I do feel that way in some of our spaces and that's really only because I haven't had the opportunity to LIVE in them yet. That day will come! Instead of buying new things, although new things rock. Similar to way #4 - it just helps you become content with what you have currently. Being content where you are also allows you to thrive where you are. Take our mantel in my the family room, for example. This is one of the main focal points in this room and I just LOVE it. I'm always changing things up trying to make it "better" and more homey or just to keep things fresh! I can sometimes get bored of certain arrangements over time. So usually I just swap a couple things from different rooms or rearrange items for contrast. (Or hire some help! Because if I’m being honest, enjoying organizing and cleaning can sometimes be REALLY HARD). Okay, this is a one HUGE thing - one that can make or break contentment at home, for sure. I absolutely find this for myself, at least, especially now that I'm at home 3 days a week for work. That can be a total of 5 days at home for me per week! I've got to have a good system in place because I can't function or create when I know my house is a mess or just out of order. This is especially noticeable for us when it comes to laundry (which radiates to almost every area we live in; most especially the bedroom) and dishes (aka the kitchen). Two of the biggest places we spend most of our time when we're home - our bedroom and the kitchen. I can do laundry all day, but I hate folding and putting things away. I don't mind doing the dishes and cleaning up the kitchen (I'd actually rather do this than my husband!). BUT. Both are a never-ending battle, right?! No matter how much laundry you do or how many dishes you clean, there's ALWAYS another shirt to wash, fold, AND put away plus another glass to throw in the dishwasher. So, we recently implemented the #konmarie lifestyle - 100%. Especially when it comes to laundry. This has helped tremendously in our washing clothes effort. Going through the process of de-cluttering and re-organizing once the #konmarie way is worth wonders. After that, it's just preventative maintenance. We came up with a schedule to keep up with laundry and are trying to stick to it! I do my laundry weekly and as soon as a load is done I #konmarie fold it and put it away. Nate does his a little less, but he wears (and also has) less than me! Dishes are another story. We've yet to #konmarie the whole house, but for the kitchen, we just try our best to stay on top of the mess right now. That usually means rinsing and putting things in the dishwasher immediately after use or spending 30 minutes every morning or evening doing a full detail clean. One day, I'd love to outsource some of our cleaning efforts to free up more of our time. It can be a pain to spend your entire weekend doing chore, after chore, after chore! But it’s really essential to creating a space and home you can thrive in. HUGE. Don't just sleep at your house. LIVE THERE. Don't always go out. Try to cook at home, have movie night at home, create a library at home, create a home office, and always have a stocked and organized pantry, so you can invite friends and family over. Make it a place you WANT to be and a place you wouldn't mind inviting others to. All of those efforts make it easier to LIVE in your home. Create reasons to gather at your house! Goes hand in hand with living at home. It's just another way you can be there more and therefore, live and thrive there more. I find it also makes our home feel more livable, by "breaking it in" to other people - that means other auras, other vibrations, and just plain-old other personality types (plus those physical elements, too) - right? Like the more people where shoes in your home, the more at ease you might get about it OR just realize hey, it's not so bad! The house didn't fall down because someone wore their shoes on your carpet! It also just brings more warmth, memories, and a new dynamic to your home. When OTHER people want to be there with you, that's a sure sign you've made it a welcoming and beautiful place. This can do wonders for not only your mental health, but just to change things up at home! It's thankfully nice where we are again - with the sun on full blast and temperatures in the 60s! It's marvelous, really. We have two outdoor spaces that always call to us on these beautiful days. Our front porch equipped with 2 rockers and our back patio equipped with a furniture set, table and umbrella, and our very own built in fire pit (so really we can use ours all year round!). This will look different for everyone. For me, I love adding white Christmas lights to faux plants for ambiance and decorative night lights. Displaying cookbooks is a past time in our kitchen and we always have plenty of catch-alls scattered in our main living spaces because my husband, bless, needs them! So, what about you? How do you thrive at home, girlfriend? What have I left off above? Tell me a few other ways we can all thrive at home! I'd love to connect. Drop me a message in the comments.